Maine Forward is supported by a cadre of liberal groups that spent hundreds of thousands in 2012 to influence legislative races. AUGUSTA — A new political action committee set up to support Democratic gubernatorial candidate Mike Michaud is backed by unions that funneled hundreds of thousands of dollars through another PAC in 2012 to alter Maine races. Maine Forward, the PAC, filed with the Maine Commission on Governmental Ethics and Election Practices on Thursday, according to Paul Lavin, the commission’s assistant director. The Maine Education Association, the Maine AFL-CIO, the Maine State Employees Association, the liberal Maine People’s Alliance and the Democratic Governors Association are backing the PAC, said Sean Sinclair, a consultant for the committee, in a statement. The Maine groups involved also composed The Committee to Rebuild Maine’s Middle Class in 2012. That group spent $758,000 — more than any outside organization aside from state parties — to influence legislative races in 2012. Spokesmen for the other candidates, Republican Gov. Paul LePage and independent Eliot Cutler, jumped on the group’s formation, saying Michaud, a six-term congressman from Maine’s 2nd District, is beholden to special interests. However, PACs are already on the ground supporting both LePage and Cutler. Maine Forward’s coalition is made up of groups with more than 100,000 Mainers as members, said Sinclair, adding that its focus will be on ending “LePage’s reign of failed leadership” and electing Michaud, who he says would strengthen Maine’s middle class by focusing on health care, education and other issues. Sinclair wouldn’t say how much money it would spend or how much of it would be used to produce ads or mailers to attack LePage and Cutler, but there may be clues in the other PAC’s history. In 2012, $561,000, or nearly three-quarters of the money used that year by The Committee to Rebuild Maine’s Middle Class, was to attack Republican legislative candidates, according to state data. Much of that was spent on negative television ads against Republicans targeted to certain districts, and Chris Quint, executive director of the Maine State Employees Association, has said that PAC will be active again this year. Large union donations comprised most of the money given to The Committee to Rebuild Maine’s Middle Class in 2012, and there was only a small, exclusive group of individual contributors. Most notable among them was S. Donald Sussman, the financier husband of U.S. Rep. Chellie Pingree, D-1st District, who gave $60,000 to the PAC in 2012. Sussman is also majority share owner of MaineToday Media, publisher of the Kennebec Journal, Morning Sentinel, Portland Press Herald and other media outlets. 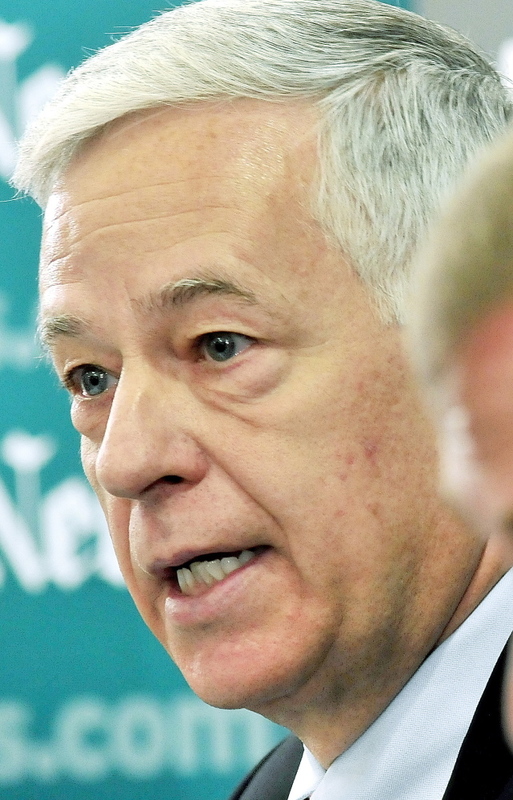 The dollar amounts spent to boost Michaud and attack his opponents this year could be much higher for Maine Forward because Maine’s 2014 gubernatorial race is among one of the most watched of its kind nationwide. That’s mostly because LePage is seen as a vulnerable incumbent, given he won with a plurality in 2010 and polling that consistently puts his support base below 40 percent. But, as his supporters point out, the last time an incumbent governor lost reelection in Maine was in the 1960s. Cutler nearly knocked off LePage in 2010 after a weak showing from Democrat Libby Mitchell, but he hasn’t polled well early on, peaking at 24 percent in one September poll, according to data compiled by Real Clear Politics. Ted O’Meara, Cutler’s campaign manager, said in a statement that there’s “no news” in the PAC’s formation, as “special interest affiliates” of Democrats want to take Maine back to the years of ex-Gov. John Baldacci, where O’Meara said there was “crony politics” and one-party rule. Cutler has said he doesn’t want PAC money, but he’s being supported by a PAC called Campaign for Maine, which spent more than $89,000 between October 2013 and year’s end to support him, state records show. The Republican Governors Association is on the ground with its own PAC in Maine, which also boosted LePage in 2010. From October 2013 to the new year, it spent $10,000 here. Its Democratic counterpart also has an active PAC in Maine. Littlefield said LePage will likely have groups spending on his behalf that boost “free markets and job creation,” but like in 2010, the governor expects to be outspent and attacked. “We’re strapped in and waiting for the punches,” Littlefield said. However, Michaud spokeswoman Lizzy Reinholt said the congressman is “extremely proud to have endorsements from groups and workers across the state,” noting that he has more donations of $50 or less than LePage and Cutler and saying he has a broad base of support statewide. “If Brent Littlefield wants to pretend that workers are Washington special interests, then that’s something he has to explain to the people of Maine,” she said.